Italian Style Lamb Shank Cabernet Stew is one of my favorite meals when it's a little chilly out! Lamb is a favorite of mine. Either you love it or you hate it! I just love the flavor, tenderness that comes along with slow cooking and what a fine wine can do to enhance the flavor of a dish. This one with Cabernet is just a perfect blend of flavors. A wonderful stew with bold flavors. A meat shank or shin is the portion of meat around the tibia of the animal, the leg bone beneath the knee. 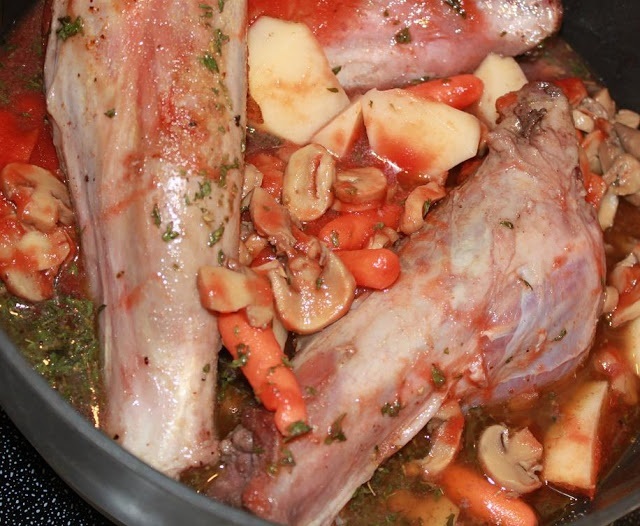 Lamb shanks are often braised whole, veal shanks are typically cross-cut. Some dishes made using shank and this meal is one of them. The shank is a meaty cut from the lower end of the lamb leg. Excellent for stewing. I love making this in a slow cooker or on top of the stove on very low heat. The longer it cooks the tender the meat gets. I often even do this in a dutch oven after searing, in the oven on low temperature. There are many ways to cook this stew. Never use a cheap wine, if you won't drink it and it tastes bad, don't ruin this dish with a poor tasting wine. Don't forget to get a loaf of crusty bread or make garlic bread. This sauce is heavenly and perfect to sop up that delicious sauce! You can use veal or even chicken legs if you're not a lamb fan. This sauce even makes a great Turkey leg stew! In a large electric fryer or large dutch oven pan for the stove top, pour oil to heat in a pan. Place lamb shanks in the hot oil salt and pepper. Saute so that all sides are browned evenly then add the freshly cleaned garlic cloves cook till golden. Add the Cabernet wine and the spices. Reduce wine to cook for 2 minutes and then add beef or chicken stock. Cook for about ten more minutes. Now either simmer in your large electric fry pan on lowest setting for an hour and a half or put into a large roaster pan and bake at a low temperature of 300. Note: you can also place in a slow cooker on low for 6 to 8 hours. Add potatoes and other vegetables. Slow cook in the oven (or whichever method you prefer) for the same amount of time or until vegetables are soft. Right about 1/2 hour before this is done, add one can of peas or 2 cups of fresh peas. 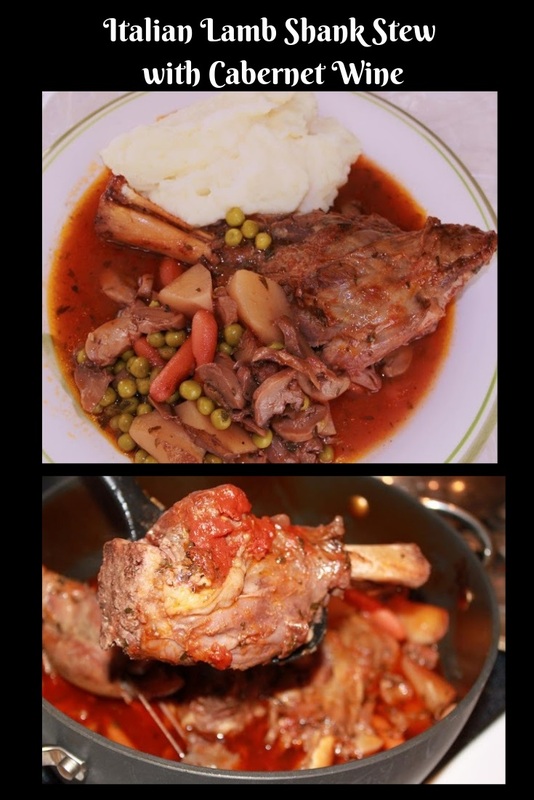 The lamb shanks literally will fall off the bone and you can place the meat and vegetables over rice or boiled pasta and lots of Italian crusty bread...this is tender, full of flavor and a great dish for the fall and winter months. My kids love the sauce over mashed potatoes even though there are potatoes in the stew already! Even though I love lamb, I have never tried the shanks. Most likely because I never came across a recipe. Your recipe here does look well worth trying, especially because you can use a slow cooker. I wish you a wonderful day in the retail world! I ate my first lamb shank in Ireland a couple of weeks ago. Now I have a recipe so I can make lamb shanks on my own. Now to find a lamb. That's a beautiful and hearty looking pot! This does look like a very hearty dish. I love stew - especially as the weather starts to get colder and colder. So delicious. I've never cooked lamb, and I really need to try that out. I can see some smoked lamb coming next summer when it warms up here. Picture perfect lamb. This will be on my stove sometime this winter - love this dish! Making your broccoli soup tonight! Melt in your mouth stuff this is. Bet it smells amazing. Love it. I'm with you--I love lamb! This looks like such a classic version of Italian lamb shanks. Buzzed. This is such a wonderful way to prepare lamb shank! Perfect fora cold day! I need to make this for Bill ASAP!!! Is '12 teaspoon garlic powder' a typo and should be 1/2 tsp ? If not, ít should be 12 teaspoons' Thanks for the recipe, can't wait to make it ! thanks for being a great cook and figuring it out! I fixed it!